WHO: RAQUEL CION, described by the New York Times as "half witch... half cabaret performer" and by TONY as an "alt cabaret siren." Director Cynthia Cahill, Musical Director Karl Saint Lucy. 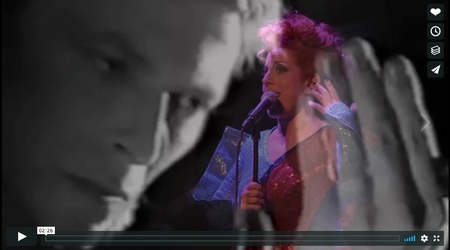 WHAT: Me & Mr. Jones: My Intimate Relationship With David Bowie, a 90-minute cabaret exploring Raquel Cion's “soul love” for David Bowie's artistry and David Jones' humanity, through personal stories and musical performance. All performances include a $20 Per Person Food / Drink Minimum. Raquel Cion keeps selling out shows, and keeps adding dates because of it. It is as if she is in perpetual encore! After a sold-out run this fall, Brooklyn-based performer, Raquel Cion, makes her return to Pangea with her cabaret, Me & Mr. Jones: My Intimate Relationship with David Bowie. The 90-minute cabaret explores the lifelong “soul love” that Cion has for David Bowie’s artistry and David Jones's humanity. Her personal stories and the deep cuts of Bowie's diverse catalog rocket us through the inner space of this "half witch, half cabaret performer" (The New York Times): growing up as an outsider, navigating the celestial realms of love, mid-life crisis, loss, and creatively moving through cancer. The piece is directed by Cynthia Cahill, with musical direction by Karl Saint Lucy. Me & Mr. Jones: My Intimate Relationship with David Bowie first walked the boards in early 2015 with a Bowie-inspired couture gown at NYC's legendary Judson Memorial Church. In June 2015, Me & Mr. Jones moved to The PIT Loft NYC, overselling within two days. The Slipper Room production in November garnered a 2015 New York Cabaret Award nomination for “Best Alt Cabaret Show,” with Cion being named a finalist for her stunning performance. After Bowie’s death from cancer on January 10th, 2016, Me & Mr. Jones was invited back for a Spring residency at The Slipper Room. In September, Cion's world was shaken by her own cancer diagnosis a week before bringing the show to Provincetown's prestigious Afterglow Festival. Me & Mr. Jones returned this spring 2018 to sold out houses at the intimate supper-club, Pangea, described by the New York Times as "a bohemian oasis not unlike the fabled Max's Kansas City from days gone by." Those performances led to a fall residency at Pangea and booking in the 2019 Philly Loves Bowie Week, in January 2019. Now on the other side of treatment, she is actively discovering new depths of meaning to Bowie's work and her own mission as an artist. Me & Mr. Jones: My Intimate Relationship with David Bowie runs select Fridays and Saturdays this fall at Pangea, located at 178 Second Avenue New York, NY 10003. About Raquel Cion (Writer/Performer): recent projects include Me & Mr. Jones: My Intimate Relationship with David Bowie, nominated for a 2015 Broadway World Cabaret Award “Best Alt Cabaret.” Productions: Pangea, NYC; Provincetown's Afterglow Festival; in NYC, The Slipper Room; The PIT Loft; Judson Memorial Church. Alas, The Nymphs BAM Next Wave; Gilding the Lonely, Joe’s Pub; Cou-Cou Bijoux Pour Vous Galapagos Art Space, Dixon Place; Rationality: A Virtual Performance and Memoir LMCC Swing Space; Directorial credits include STRAYS winner of the 2016 New York Innovative Theatre Award for “Outstanding Original Short Script" and published in THE BEST AMERICAN SHORT PLAYS, 2015-2016 by Applause Books in 2017, The Brick Theater, Ars Nova’s ANT Fest and Showgasm; SONS Ars Nova’s Showgasm; Darkling IRT Theater, CATCH SERIES; HIP IRT Theater; On a Lonely Road...Travelin’ with Joni, The Duplex. She is a founding member of NYC’s Eat a Radish Productions and performs with the Obie Award winning The Secret City. Cynthia Cahill (Director) has been working around the country, regionally, and both on and Off Broadway for over 17 years. She was a part of the creative team that brought the musical, Passing Strange, from Berkeley Repertory Theatre to The Public and onto Broadway and was also involved in the making of the Spike Lee movie of the musical. Previously based in San Francisco, she is now proud to be expanding her career here in NYC. Karl Saint Lucy (Musical Director/ Piano) is a New York-based composer, pianist, and vocalist. With Josh Sharp and Aaron Jackson (The Opposition with Jordan Klepper), he wrote F**king Identical Twins, a one-act musical developed at UCB and currently being optioned for feature film adaptation by Twentieth Century Fox/Chernin Entertainment. His musical, Class, written with Maria Alexandria Beech, was a finalist for the 2017 National Musical Theater Conference at the Eugene O'Neill Theater Center; he also scored her TV pilot, Telemamas. He was an alto finalist for the internationally acclaimed, Grammy Award-winning men's chamber choir, Chanticleer, in 2017. He is a graduate of the Graduate Musical Theater Writing Program at NYU's Tisch School of the Arts.